Honeymoon Luxury Satin Bed Sheet Set, Ultra Silky Soft, Queen in Black. It includes 1) Flat Sheet 90 x 102 inch; (1) Fitted Sheet 60 W x 80 L inch; (2) Pillowcases 20 x 30 inch that has a silky feel and cool to the touch that will give your bed a romantic vibe but also a satin, smooth touch on the skin. Machine wash in cold water with similar colors, tumble dry low, do not bleach. Brushed microfiber is a type of material that is lightweight, elastic, and wrinkle-resistant. It is stronger and more durable than cotton sheet sets. Honeymoon brushed microfiber sheet sets give you an incomparable comfy enjoy. The soft sheet set makes you never want to get out of the bed. 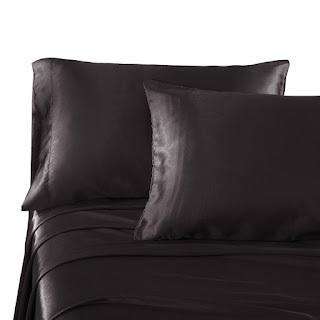 My Opinion: this is my first ever satin sheet set and I do like the way they feel on my skin and will be perfect in the summer months when it is hot here and I want it to feel cool to the touch. I wash these for the first time and had no problems with the sheets and pillowcases staying together so I found them to have great quality. I don’t typically use black sheets but these are great. These are so comfortable to sleep on and if you look into the romantic these give a great feel.